How to preview the Revelation 12:1-2 sign…. Yesterday evening, my youngest son was frustrated, so he went out on the tractor after sundown and began turning the compost pile. We left him alone until well after dark when he, by headlights, was still moving compost. I decided to walk out to talk to him. On my way out, I saw a bright star just above the very dark horizon and curiosity got to me. After speaking with him, I opened the Google Sky app on my phone and held it up to see what the bright object was, and realized, we can see most of the Revelation 12:1-2 sign at or right after sundown right now. 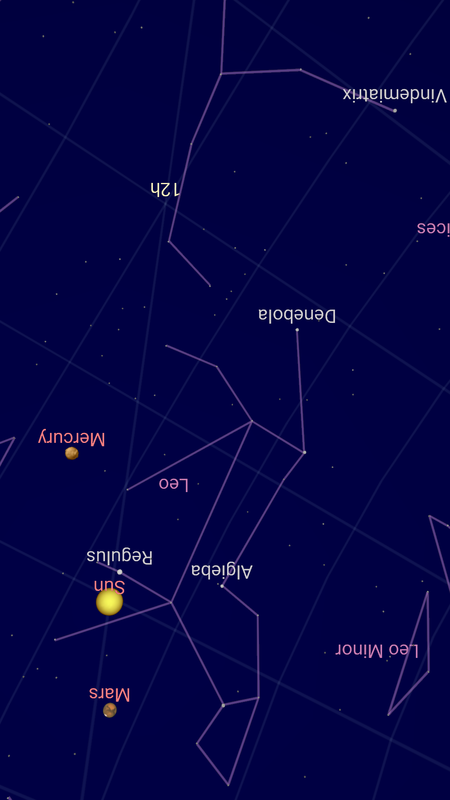 Here are two screen shots of the Google Sky app on my phone to show you what I am talking about. Notice that the sun, as Dale Sides explains here, is between the front feet of Leo. At sunset, the planets around the sun may be visible, but they should be clearly apparent during the eclipse tomorrow. 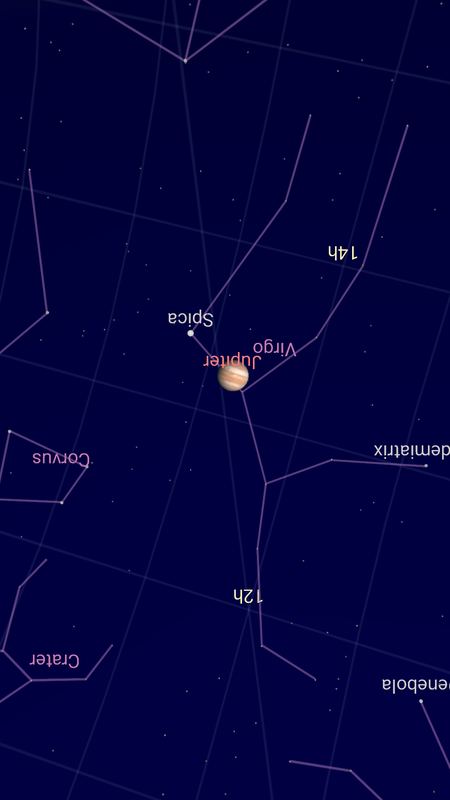 Virgo, or Betulah according to the Hebrew names, is carrying Jupiter, also known in Hebrew as tzedek, or ‘righteousness,’ in her womb and she trails Leo through the sky meaning she is still quite visible after the sunsets. What is significant about the Revelation sign is that it appears before, or right at, sunset making it difficult to see the whole picture. By viewing Virgo after sunset tonight (and any night before September 23, 2017) helps us see what will be happening on that day as the planets and stars all align with a tiny moment in time when the moon is at her feet. One month later, when the moon again returns to this point, the planets, or ‘wandering stars’ as the ancients considered them, will have moved, several considerably. I recommend viewing Virgo tonight to have a good idea what you are looking for when the eclipse happens tomorrow and the ‘lights in the theater’ are dimmed. Having the Google Sky app installed on your phone will really help, too! This entry was posted in A Thought... and tagged betulah virgo, Google sky app, preview eclipse, prophecy, Revelation 12, sign in the heavens. Bookmark the permalink. 1 Response to How to preview the Revelation 12:1-2 sign….